The bow pitched upward as we passed through a ferry wake at 16 knots on our way from Anacortes, Washington, to Friday Harbor. I subconsciously braced for impact, but it never came. 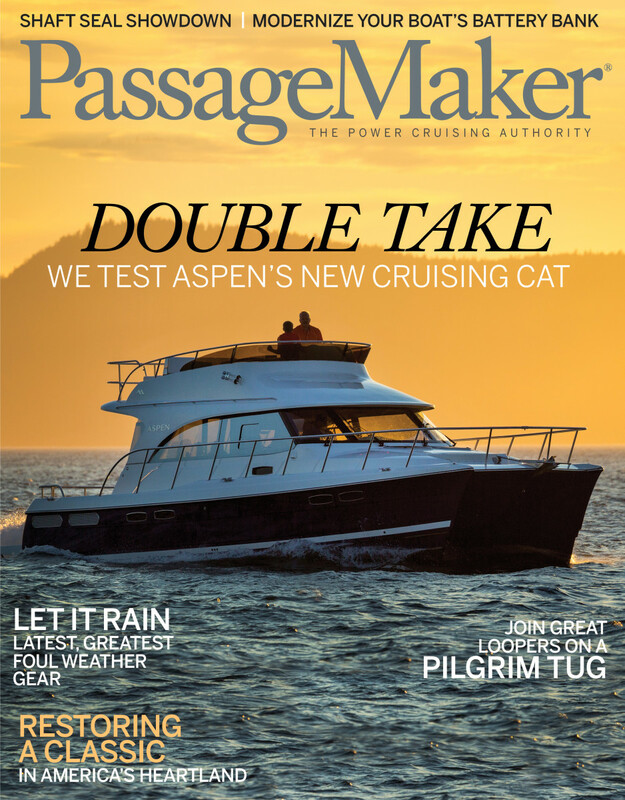 “This is the only boat on the market with a built-in suspension system,” explained Larry Graf, who founded Aspen Power Catamarans in 2008. Cruising through a confused chop of 2 to 3 feet, the Aspen C120 didn’t pound, pitch, or roll. In fact, her ride was eerily smooth and quiet. 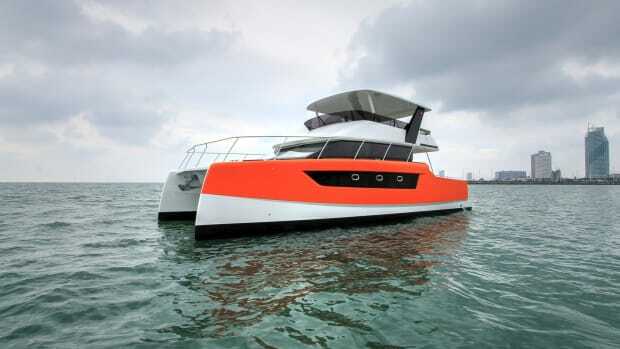 The C120’s ride is the result of Aspen’s proa hull design. 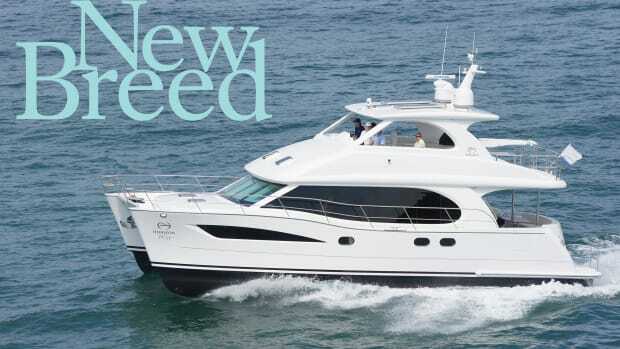 Though she seems symmetrical to the naked eye, the starboard hull, which houses the single Volvo D6 diesel, is 35 percent larger than the port hull, and the deckhouse is offset slightly to port. It sounds unbalanced, but works well. Underway, the C120 tracks accurately at any speed, requiring little helm input, even in quartering seas. Graf has applied his wealth of multihull design experience to the C120. 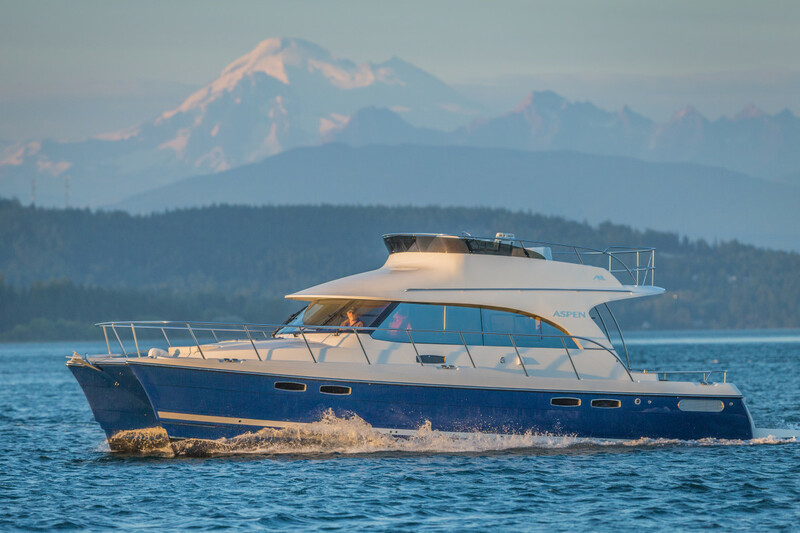 In the ’80s, he founded Glacier Bay Power Catamarans, which were also known for their efficiency, smooth ride, stability, and build quality. After leaving Glacier Bay, he launched Aspen, first with the 28-foot C90, then the 32-foot C100, and now the 40-foot C120. Helm visibility from the lower helm is stellar in all directions. Stepping aboard the C120, I was hit by the boat’s solid feel. Aspen uses pure vinylester resin and 18-ounce fiberglass woven roving during the layup process. To compensate for the thinner roving, Aspen employs additional layers, which takes more time to assemble, but the result is a much higher than usual glass-to-resin ratio and a stronger structure. The bow sections are reinforced with Kevlar, then, a watertight bulkhead is made from Coosa—a fiberglass-reinforced polyurethane—glassed into place a few feet abaft the bow. An additional piece of triangular Coosa is then installed horizontally, with the pointy end facing forward and the after end butted up against the watertight bulkhead. After glassing this piece into place, the entire area is filled with foam, creating a watertight, formidable collision zone. Coosa, glassed in place with ¼-inch-thick fiberglass, is used extensively throughout the C120’s structure. Each hull has three watertight bulkheads and several additional bulkheads. Structural beams, again made from Coosa glassed into place, reinforce the hull every three feet. A molded-in keel with a stainless steel sand bar protects the single prop and rudder from damage. The 81-square-foot cockpit is entered from either side, and the cabin’s overhang is high enough that even tall boaters won’t hit their head as they step over the gunwale. The shape and volume of each hull manages the flow of water through the tunnel, allowing the bow sections to oppose the prop’s thrust. Tracking is straight and true. Once aboard, I was struck by many thoughtful touches. 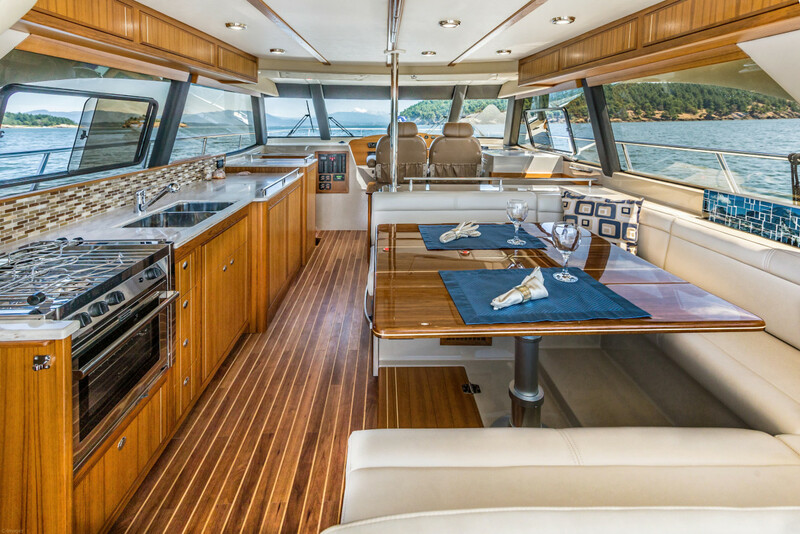 A bar, with two built-in seats, a varnished teak table, and a drawer refrigerator, occupy much of the after cabin bulkhead. The huge window on the bulkhead opens upward and latches into place, making the saloon and cockpit a single, open-air space when the weather cooperates. A bench seat along the gunwale opens, providing stowage for fenders, cleaning supplies, and other necessities. An additional large hatch in the transom leads to another cavernous locker, which is perfect for wet stowage. Our test boat had a large Magma barbecue stored inside, plus three fenders, and there was still room to spare. The 40-inch-long swim step, supported by four 1½-inch-diameter stainless steel triangles, has a molded-in deck box with an isolated propane locker and storage for even more deck gear. 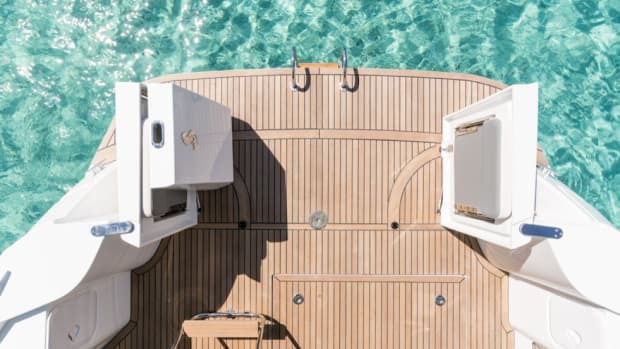 An easy-to-negotiate stair on the port side of the cockpit leads to the optional flybridge, which has seating for seven and a well-appointed helm station. I was most impressed by the Aspen-designed davit system. It’s a polished stainless steel device that can hold a 10-foot 6-inch dinghy. An electric winch in the transom raises and lowers the davit quickly and easily. Once the dinghy is launched, the davit provides a secure handhold when getting into or out of the dinghy. Unlike most transom-mounted davits, this one can be lowered fully into the water. A swim ladder is integrated into the davit and fiberglass strips, complete with nonskid, are attached to the top of the davit so they cleverly fit flush into swim step cutouts. When it’s fully deployed, the davit is nearly invisible and allows full use of the platform. Walk-around side decks make tending to lines and fenders safe and easy, thanks to well-positioned handrails and aggressive nonskid decking. Most of the boat’s machinery is located under hatches in the cockpit to help isolate noise and odors from living spaces. These hatches are notable for several reasons. They don’t flex when you stand or jump on them, and they’re thoroughly soundproofed, reducing machinery noise underway. 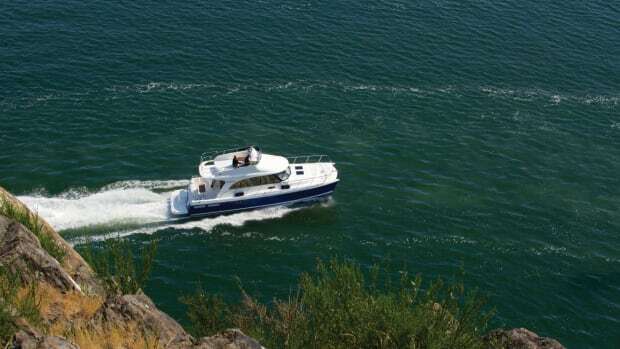 The Volvo Penta D6 is hidden beneath three hatches on the starboard side of the cockpit. 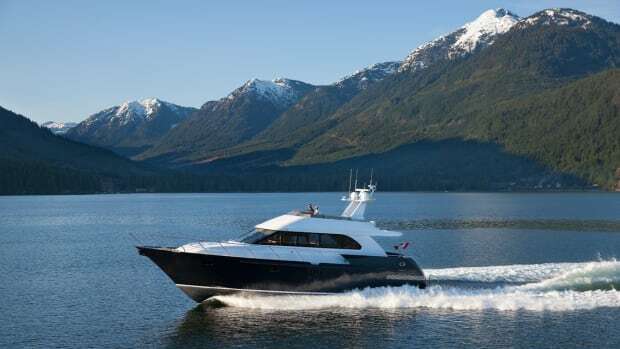 Our test boat had the optional 435-horsepower version of the D6, a modern, common-rail diesel that is both turbocharged and supercharged. Volvo’s 330-horsepower D6 is standard, but both powerplants are mated to a V-drive transmission. Equally important, the dipstick, oil, fuel filters, belts, and other service points are all easily accessible. An optional 210A Balmar alternator was installed on our test boat to charge the house bank of four golf-cart batteries. Aspen installs this alternator in addition to, not instead of, the standard 115A Volvo alternator, providing redundancy and greater output. Our test boat had the optional 5kW Northern Lights genset (a 5kW Kohler is standard) tucked into the port pontoon. 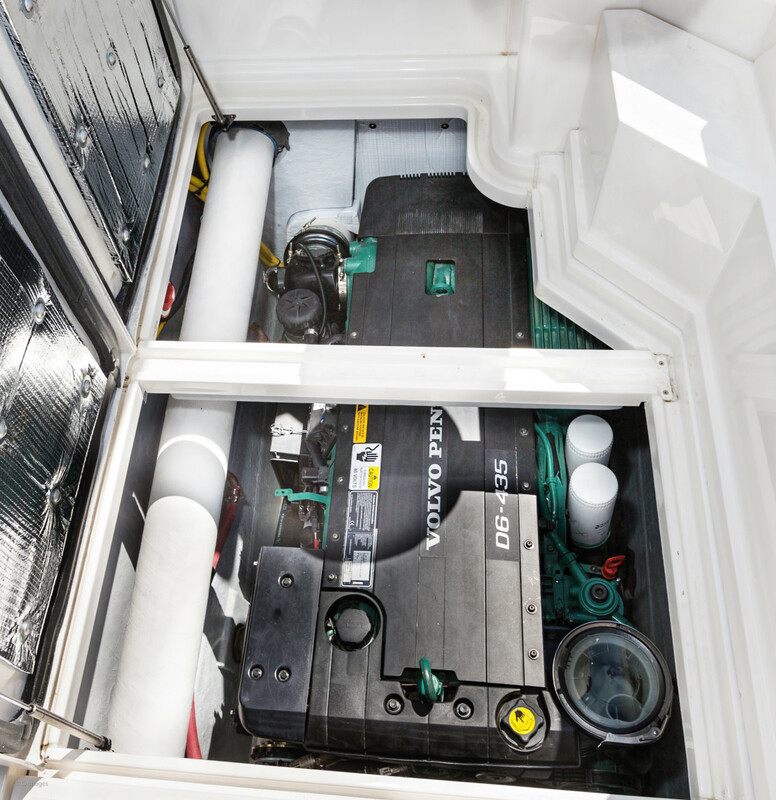 A sound enclosure and standard water-lift muffler make the genset nearly silent, both inside the boat and out. In lieu of the standard Wallas forced-air heater, a hydronic Webasto furnace is installed in the same compartment. 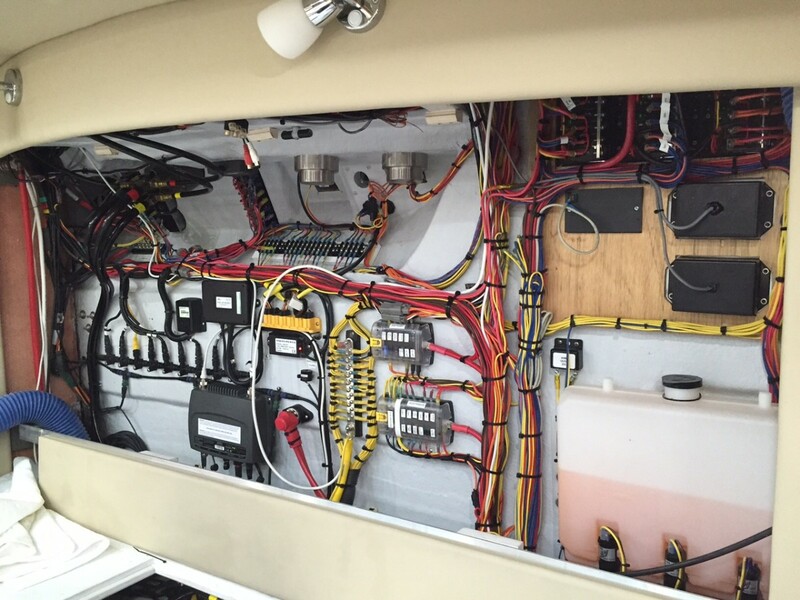 The level of finish for all the systems aboard is top-notch and organized. Since many systems are installed in both the port and starboard hulls, the C120 has built-in redundancy. 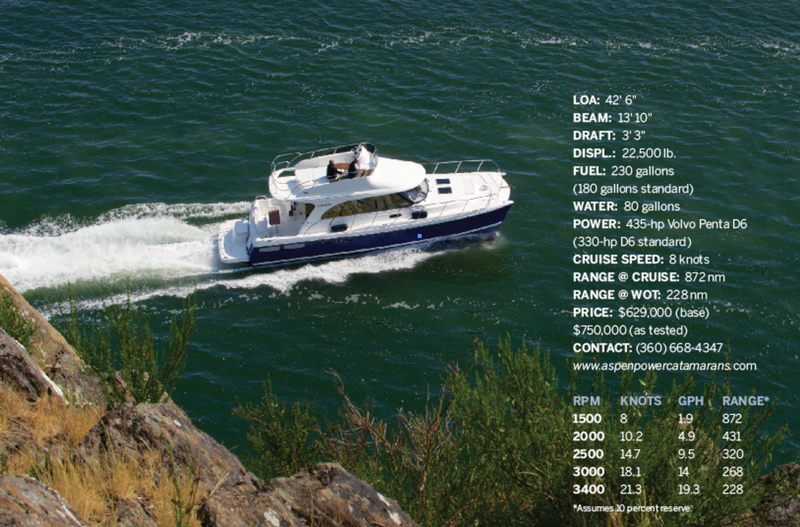 For example, the freshwater system has a 40-gallon tank and pump in each hull. If one pump fails, or one tank becomes contaminated, the other is ready to use at the flip of a switch. The interior of the boat is accessed through a large glass door. 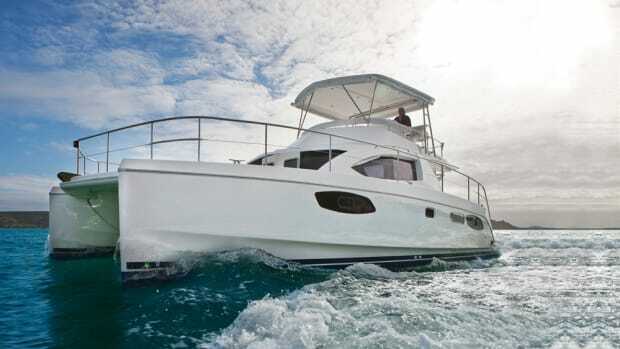 As on many powercats, the saloon, galley, and helm are a single space. Amtico, in an imitation teak-and-holly finish, covers the sole. Amtico is nearly indestructible—scratch-resistant and impervious to water—and makes for an excellent imitation of real wood grain. All of the joinery is fashioned in-house from Burmese teak. 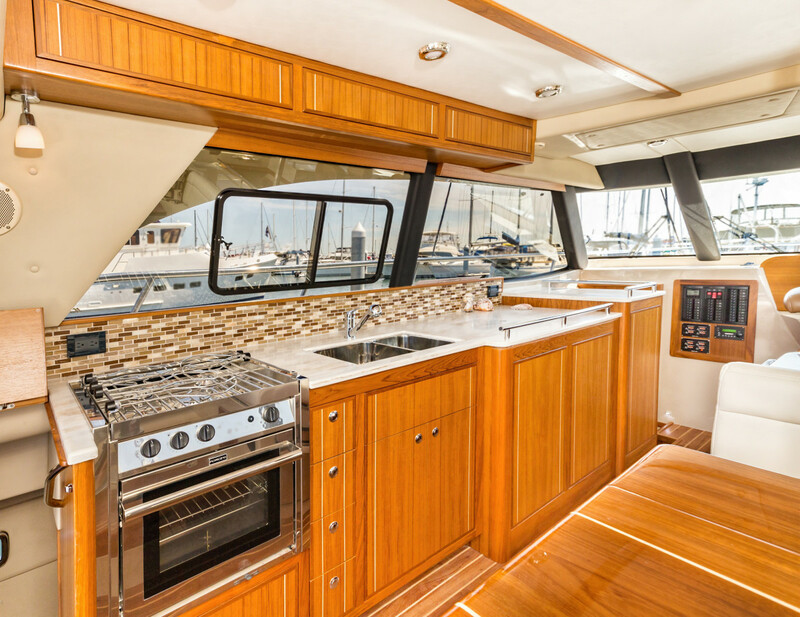 To port, a 15-foot galley sports a three-burner Force 10 propane range, double sink, and acres of Corian countertop. Separate under-counter NovaKool refrigerator and freezer units are forward, underneath the helm seats. A drawer-style microwave pulls out from under the settee. Opposite the galley, a U-shape dinette offers seating for six at a high-gloss teak table, which raises and lowers at the touch of a button. Two of the settee seats recline electrically, making the settee equally comfortable for dining and lounging. Additional storage is below the settee. Forward of that is the primary helm station. 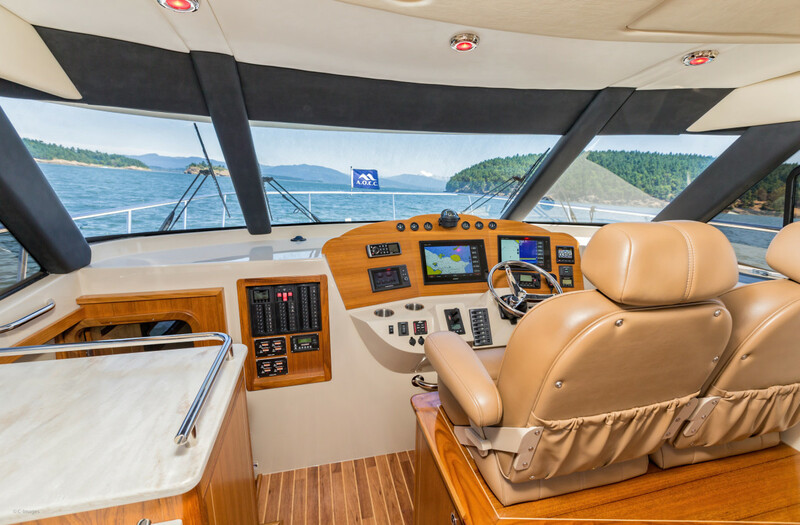 Sightlines are excellent in every direction, and the molded-fiberglass console holds a bevy of optional Garmin electronics: Engine instrumentation, VHF radio, and vessel controls are all in good sight. 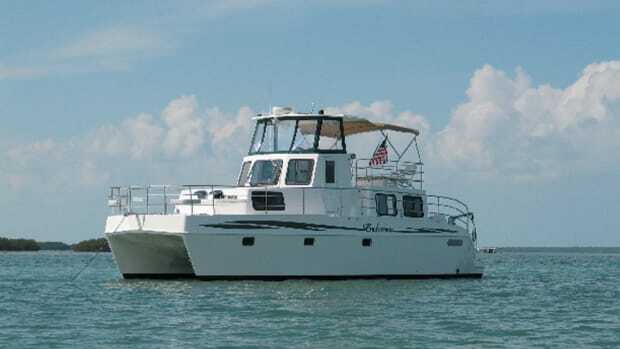 Unlike most 40-foot boats, the C120 has two heads and three staterooms. The master stateroom is forward and can be accessed via the port or starboard stairs from the saloon. Because the full 14-foot beam is carried all the way to the bow, the master is enormous. A king bed sits on centerline, with two large opening hatches above, providing ample light and ventilation. Storage comes in the form of full-beam cabinet, offering two hanging lockers and a concealed flatscreen TV. Graf graciously gave me the master for our test, and I was impressed with how quiet the stateroom was, even with wind-driven chop entering the marina. The full, ensuite head is in the port hull, abaft the master stateroom. The guest head and one of the guest staterooms are in the starboard hull and are every bit as nice as the master. A door on the forward end of the guest head opens into the master, so when just the owners are aboard they can take advantage of his-and-hers heads, negating the need to climb over one’s bunkmate to access the head. 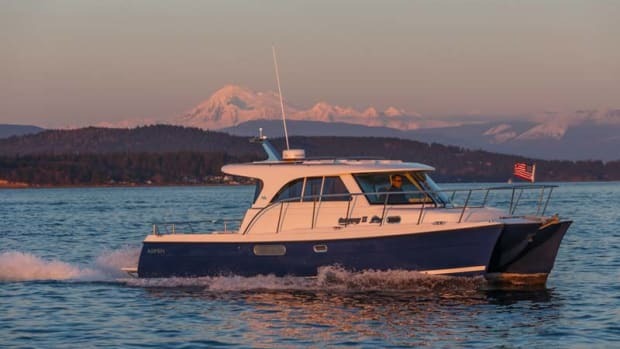 The more spacious of the two guest cabins is in the starboard hull and features a queen-size bed as well as a hanging locker and several storage cubbies. The third stateroom is accessed via its own stairs in the aft, port corner of the saloon. Maneuvering the C120 through the marina is easy, thanks to an oversize rudder and standard Sidepower bow and stern thrusters. Of course, cats track very well in reverse, anyway. Our test boat came with the optional variable speed thrusters, which provide more precise control and longer run time than the standard thrusters. My first indication that the C120 was no ordinary boat underway came upon exiting Cap Sante Marina. The wind was blowing 15 to 25 from the south, stirring up a confused chop just outside the marina. Traveling at just 5 knots, I expected the boat to roll and lurch. Instead, it rode flat, seemingly not noticing the lumpy seas. Once the engine had warmed to operating temperature, I throttled up. The C120 accelerated, but the bow stayed level and the boat tracked straight, skimming across the channel at 16 knots. Dozens of crab-trap buoys littered the waterway and the C120 handled my zigzagging with aplomb, cornering flatly and predictably. Even with full fuel and water tanks and an admittedly grungy bottom, our test boat achieved excellent speed and economy (see table, inset at left). After spending 24 hours aboard the C120, I’m impressed. Impressed with the ride and fuel economy, impressed with the build quality, impressed with the structure and the usable space. At about $750,000 as tested, the C120 is an expensive boat for its size, but the quality, roominess, and performance are worth the price of admission.